Darjeeling, Bengal’s prime tourist destination, is also one of its most troubled spots. Sandwiched between Sikkim and Nepal, this verdant and picturesque slice of the eastern Himalayas has seen frequent bouts of agitations demanding a separate state of Gorkhaland over the last 35 years. But, while the earlier agitations resulted in limited autonomy for the Gorkha-majority Darjeeling Hills, the last shutdown in 2017 led to unprecedented and brutal repression by the Bengal government that has left the people of the hills hurt and angry. And it is this simmering anger that will determine the outcome of the Lok Sabha polls here. The 2017 agitation called by the Gorkha Janmukti Morcha (GJM)--the dominant political force in the hills--took the form of a 104-day shutdown that brought life to a standstill and resulted in huge economic losses. The Mamata Banerjee government adopted a two-pronged approach to tackle the unrest: it divided the Morcha and let loose a reign of repression. Police brutalities, including firing by police that resulted in many deaths, incarcerating people with false cases of rioting, murder, possession of arms and blocking of highways slapped against them, midnight raids on houses of even supporters of the statehood movement, custodial torture by police and barbarous human rights violations followed. The Morcha leaders who refused to be bought off and abandon the statehood demand were hounded out of the Hills with hundreds of allegedly false cases registered against them. Most of the top leaders of the hardline faction of the Morcha led by Bimal Gurung are fugitives. But that has not made them unpopular with the Gorkhas in Darjeeling. Gurung communicates with the Gorkhas through social media and his YouTube clips are viewed by tens of thousands of people. However, the pro-Mamata Banerjee faction of the Morcha led by Binay Tamang remains deeply unpopular primarily because Tamang and his cohorts are looked upon as traitors to the Gorkhaland cause. More so since he is perceived to be supporting the continuing repression by the state administration of the Gorkhas in the hills. The Trinamool, and Mamata Banerjee herself, are also despised by the Gorkhas, despite the chief minister showering development projects and doles on the Hills. So pervasive and deep is the fear of the repressive state administration that even victims of police atrocities refuse to give out their names when they speak of their sufferings. There are hundreds of accounts of how innocent people, even school kids, were picked up by the police for supporting or even on suspicion of supporting the statehood demand. 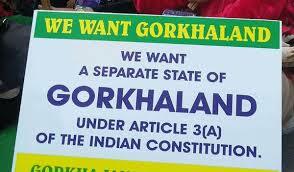 Merely uttering ‘Gorkhaland’ can land one in police custody even today. There are heart-wrenching accounts of the arrested being tortured. There are horrific accounts of midnight raids by the police on houses of Gorkhaland supporters and activists and the high-handedness of the men in uniform. Ladies speak of cops even destroying their kitchens and food, breaking furniture and looting valuables. One young man angrily recounts how cops took away medicines meant for his father who was recovering from a heart attack. An old woman cries bitterly while narrating how her school-going grandson was slapped and assaulted by cops for having written ‘Gorkhaland’ on a notebook. Accounts of gross and blatant violations of human rights are common. “The reign of terror unleashed by the chief minister on us during and after the (2017) agitation was horrible and has never happened anywhere in the country. Not only the Morcha leaders and activists, anyone even remotely suspected of having links with the Morcha or supporting the Gorkhaland state demand were subjected to police brutality. False cases were slapped against them and most are still fighting those cases. Many people were killed in police firing, but the state has refused to acknowledge that. Apprehending arrests, many have fled and the state has attached their properties. Many homes and families have been destroyed. The scale of human rights violations that had taken place and continues even today is unheard of and incomprehensible,” says a prominent human rights activist who refused to be named for fear of being arrested on false charges. That is why the Gorkhas are angry. But they cannot express this anger openly, not even on social media. “Even if a person reacts with a ‘like’ to a social media post critical of the chief minister or the Bengal government, or a post in favour of Gorkhaland, he or she will be picked up for questioning by the police. This has happened. The state authorities monitor social media very minutely and any activity that is deemed to be anti-government or anti-Trinamool is punished,” says Ajay Edwards, the vice-president of the Gorkha National Liberation Front (GNLF). The GNLF, under the leadership of Subhas Ghising, spearheaded the first statehood stir in the mid-1980s that led to the creation of the semi-autonomous Darjeeling Gorkha Hill Council (DGHC) through a tripartite agreement between the GNLF, the Union government and the then Left Front government in Bengal in 1988. Edwards, who owns the iconic Glenary’s restaurant in Darjeeling town, cites his own case to illustrate the repression of Gorkhas by the Mamata Banerjee government. “The Morcha had started hounding us and we developed an understanding with the Trinamool. But about a month ago, that understanding came to an end when we declared that we will chart an independent path for the Lok Sabha polls and will not support the Trinamool candidate. Ever since then, many cases have been lodged against me. The charges against me range from trying to set a police officer on fire to disturbing communal harmony and blocking highways. That all these cases have been registered against me as soon as we broke ranks with the Trinamool shows that they (the charges) are false. But we will not be deterred by these false cases,” he says. Edwards also gives the example of J B Tamang, the leader of the Hill Plantation Workers’ Union which is the labour arm of the GNLF. “Tamang has been working for implementation of basic minimum wages for tea garden workers and is very popular. He has been organising tea garden workers and since our Union has been gaining popularity, it was seen as a threat by Trinamool and its allies in Darjeeling. Tamang was arrested last month on false cases like obstructing the police from carrying out their duties and blocking highways,” says Edwards. In fact, these two--obstructing the police from their duties and blocking highways--are the most common charges in cases registered against the hundreds of Gorkhas. A leader of the Communist Party Of Revolutionary Marxists (CPRM) says that the Bengal government’s thinking that the Gorkhas can be won over with doles is deeply flawed. The CPRM was formed by CPI(M) leaders belonging to the hills who were disappointed over their parent party’s opposition to the GNLF-led Gorkhaland agitation of the mid-1980s. “The chief minister thinks she can assuage our hurt and gain our support by giving us a university, or announcing some doles and sops, or sanctioning development projects for Darjeeling. This thinking hurts our self-respect and makes us angrier,” he said. The Darjeeling Lok Sabha seat has been a prestigious one, but never the exclusive preserve of any single party. The Congress and the CPI(M) won the seat many times, and over the last two terms, the BJP has been winning this seat with the firm support of the GJM. Jaswant Singh won Darjeeling in 2009 and S S Ahluwalia in 2014. The Trinamool has fielded a former academic, Amar Singh Rai, as its candidate from Darjeeling. Rai actually belongs to the GJM, and had won the Darjeeling Assembly constituency in 2016 on a GJM ticket and had defeated his Trinamool rival by a handsome margin. After the 2017 agitation, he distanced himself from the hardline faction of his party and aligned with the Binay Tamang faction that is close to the Trinamool. But the angry Gorkhas regard him as a turncoat and even though he is respected as an academic, he appears to have forfeited the support of the people as a politician. The BJP’s Ahluwalia had become unpopular with the Gorkhas because of his perceived indifference to their sufferings during and after the 2017 stir and it thus became imperative to replace him. The BJP did that and, in close consultation with the Bimal Gurung faction of the GJM as well as leading citizens of Darjeeling, nominated Raju Singh Bista as its candidate. Bista, though a Gorkha, hails from Manipur and is a successful industrialist. He has a long association with the RSS and is perceived as intelligent, articulate and a fresh face with youthful charm and earnestness. It is pertinent that two candidates from this seat--CPRM’s R B Rai and Swaraj Thapa (Independent)--have withdrawn in Bista’s favour. Darjeeling will witness a largely two-cornered contest between the BJP and the Trinamool and the others--CPI(M)’s Saman Pathak and Congress’ Sankar Malakar--do not count for much. The Darjeeling Lok Sabha seat has seven Assembly segments: Darjeeling, Kurseong and Kalimpong in the Hills and Matigara-Naxalbari, Siliguri, Phansidewa and Chopra in the plains. The Gorkhas are in an overwhelming majority in the Hills and are a decisive factor in Matigara-Naxalbari and Siliguri. Bengali Hindus are in a majority in Siliguri and Chopra, but these Assembly segments also have sizeable populations of Gorkhas, Adivasis and Rajbongshis. The Adivasis and Rajbongshis are unhappy with the Trinamool, the former for the state government’s failure to rejuvenate tea gardens where most of them work and the latter for the state’s perceived antipathy towards their demand for a distinct identity. Adivasis form the largest ethnic group in Phansidewa. The Bimal Gurung-led faction of the Morcha commands the undying but silent (silent due to fear of state repression) loyalty of an overwhelming majority of Gorkhas. With this faction fully backing Bista and Gurung appealing to people to vote for him, Bista’s win in the three Assembly segments in the Hills is certain. As for the plains, the BJP has gained strength and popularity in those areas over the last few years. In the 2016 Assembly polls, the Trinamool candidates trailed much behind the GJM candidates in the Darjeeling and Kurseong seats, while the Trinamool-supported candidate was also convincingly defeated by the GJM in Kalimpong seat. Since then, thanks to the brutal state repression of Gorkhas during and after the 2017 unrest, the Trinamool is an intensely-disliked entity in the Hills. The Matigara-Naxalbari seat was won by the Congress and though the Trinamool was the runner-up, the BJP bagged 21.3 per cent of the votes. The CPI(M) won the Siliguri seat in 2016 and here too, the Trinamool was the runner-up but the BJP’s vote share was 11.46 per cent, nearly three times the figure of 4 per cent in 2011. The BJP, say party leaders, would have done much better had the Trinamool not fielded popular footballer Bhaichung Bhutia from the seat. “Many Gorkhas and football-crazy Bengalis voted for Bhutia, or we would have been in second position in Siliguri,” said Srikumar Haldar, a local BJP leader. Phansidewa is an Adivasi stronghold and has always sent Adivasi candidates to the state Assembly. In 2016, the Congress won the seat while the Trinamool was in second position and the BJP in third. The BJP’s vote share was 18.14 per cent, up from 4 per cent in 2011. Since then, the BJP and its frontal organisations have worked very hard among the Adivasis and other sections and garnered considerable support among them. The BJP has also strengthened its support base within the Bengali Hindu community in this seat. Chopra is the only Assembly segment where the Trinamool is strong, and that is because Muslims are the largest group there. But the BJP enjoys the support of other communities and ethnic groups in Chopra. The overall analysis is that the lead that Bista is expected to gain from the three Gorkha-dominated hill segments will place him in a very comfortable position. Bista is also expected to get a majority of the votes in Matigara-Naxalbari and Phansidewa constituencies and could pull through in Siliguri. It is only in Chopra Assembly segment that the Trinamool candidate’s chances are bright. But the gains there will not be enough to pull Rai through, given the losses he is expected to suffer in the rest of the constituency.